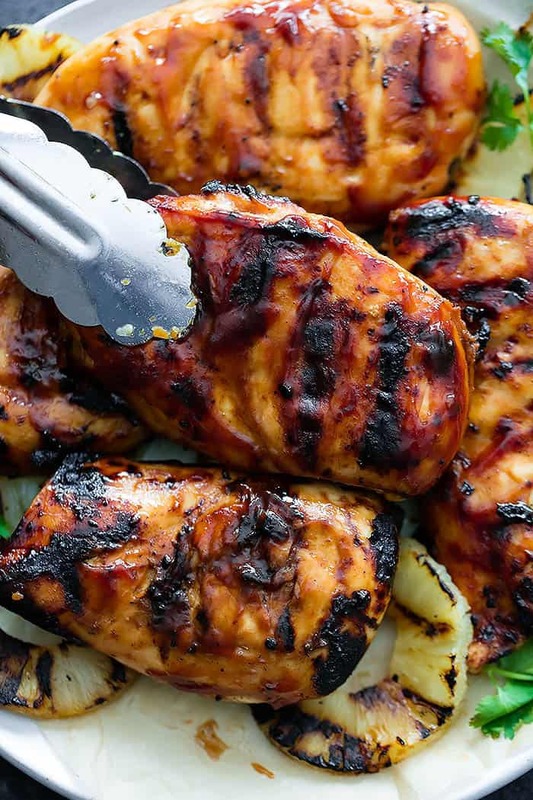 Grilled Hawaiian BBQ Chicken is quick and easy and the flavor is amazing! Served over grilled pineapple this is sure to be a hit! Yessssss! It’s officially grilling season and I could not possibly be more excited about it, grilling is my jam. This is a dish I make all the time at my house – it’s so dang easy, has amazing flavor, and HELLO there is grilled pineapple involved! No brainer right?? The sauce is used as both a marinade and a topping and I always want to lick the plate clean because the flavor is so good. The great thing is that you can use your favorite bbq sauce as the sauce for the base – homemade or store-bought, whatever you love the most! In a bowl, whisk together bbq sauce, juice from the can of pineapple slices, soy sauce, and garlic. Pour half of the mixture into a large resealable bag. Add oil and chicken. Seal bag and chill for at least 30 minutes or up to overnight. Reserve remaining sauce mixture and chill until ready to use. Grease and preheat grill to medium heat. Remove chicken from bag, discard bag and marinade, and grill chicken for 6-8 minutes on each side or until cooked through. Grill pineapple slices along with the chicken, 2-3 minutes on each side til heated through and just beginning to char. 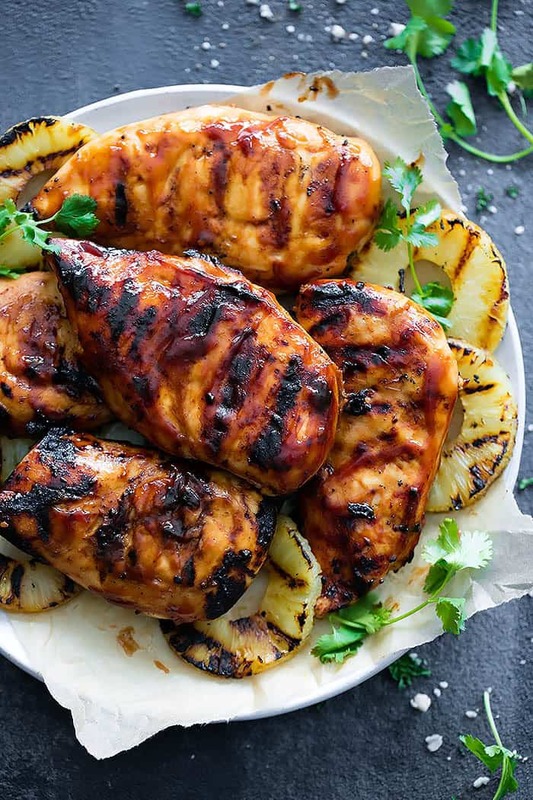 When chicken is finished cooking, brush with reserved sauce, top with chopped cilantro and serve with grilled pineapple slices. *Prep time does not include at least 30 minutes of marinade time. We made this tonight for dinner. It was super quick and easy to put together and so, so tasty. We will definitely be making it again!! hey girl this looks oh so tasty! Thanks for this recipe, tried it a few weeks ago and it was a hit. Making it again tonight. I made this last night and my family LOVED it! Thanks for the recipe! Have to make this it looks delicious. It does look delicious but it tastes even better! This chicken is amazing and has so much flavor! Happy cooking! NO GRILL! Can this be made in an oven? Yes, of course! I would cook it at 375* for 40 to 45 minutes until chicken is 165* in the center. I hope that helps! I used to try this food when I was in Indonesia. It was so yummy. And now I know how to make it via your recipe and instruction. Thanks for this. gonna make one for my dearest love. Thumb up. That is awesome!! I am so glad it brings back memories and tastes similar! Thanks so much for following along with me!! 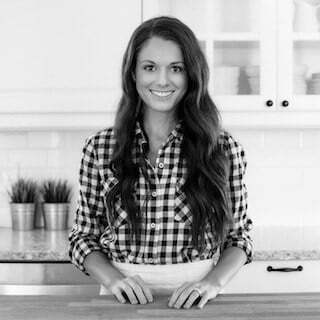 Could you use canola oil? Would adding brown sugar be a terrible idea? Nice food!I will bring this idea to do this food with my son birthday,thank for sharing. Is the garlic in the recipe referring to minced fresh garlic or garlic powder? Thanks for the great recipe!! How would you make this for a party? I have about 18 adults coming and I was wondering the ingredient ratio. Beautiful recipe. Thanks very much. I am trying to make myself one of the best Hawaiian grill chickens and this would be the best recipe and ideas on the same that I found. Great. Thank you very much for the post. Hey buddy, thanks for your delicious post. I mean amazing post. Another healthy post as always. Keep posting, looking forward to more from you.